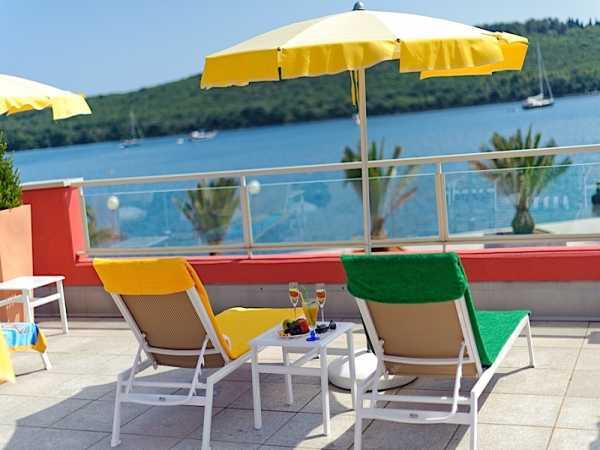 Villa Zadar is a charming antique house situated in a quiet bay on the northern side of the island, in a secluded area outside the village of Pasman, just few minutes by foot from the old town. The combination of the local tradition, personally selected furniture and decorations, together with the Mediterranean garden and private pool, makes this house a perfect retreat for your holiday. The accommodation is suitable for up to 6 persons (+2 children) and ideal place for families with children of all ages. 250 square meter interior is a combination of antique furnishing and modern amenities, providing the highest standard of comfort, luxury and aesthetics. Inside, the villa has 3 bedrooms, 4 bathrooms, a spacious living and dining room, fully equipped kitchen, utility room with laundry and fitness room with sauna. The bedrooms, situated on the first floor, are all equipped with king size double beds, air conditioning / heating, satellite TV and private bathrooms. The kitchen is fully equipped with all “must have” tools for preparing different kind of meals and easy cleaning: oven, grill, gas and electric cooker, dishwasher, fridge and freezer, … The living room, with two sofas, armchair and table, board games, TV with satellite receiver and home theatre cinema is an ideal place to enjoy your evenings or to spend time in the villa when it’s raining. Next to the living room there is a fitness room and infra red sauna meanwhile the open air Jacuzzi is available in the backdoor, outside the villa. The Wireless broadband internet connection – WI-FI Internet - is available in the whole house area. 1.000 square-meter exterior provides an authentic Mediterranean outdoor living experience. Fully equipped open air kitchen with barbecue and patio dining area, 35 square-meter private swimming pool, open air Jacuzzi and spacious garden with Mediterranean plants are ideal places for your relaxation. In front of the house there is also a playground with plenty of toys where your children can safely play meanwhile you enjoy your time completely relaxed. At the entrance of the property there is a parking place for 3 cars whereas the beach is located only few meters beyond.